In this article, we have present you how to do the Factory Reset in the android mobile. Along with that we have also describe you what would happens when you do a factory reset and what are all the prior steps you have to taken before start to proceed. What happen when you do a Factory Reset? Once you have decided to factory reset your smartphone keep in mind that it will completely wipe your internal data of the device and return it to the default factory settings. It not only wipe the internal memory; it also delete the external memory (i.e. SD card). If you want again you need to re-install all those things. Why should you have to do? 1. Resetting your phone to original settings may fix numerous issues. It is one of the most useful advantage. 2. If you want to sell your phone, or you want to return it to the manufacturer then you should delete all your personal settings. At that time it will be useful for you. 1. Before start to factory reset you are strongly recommended to take backup of any important data or files you don’t want to miss. 1. From the Home Screen, Click the Menu button. 3. 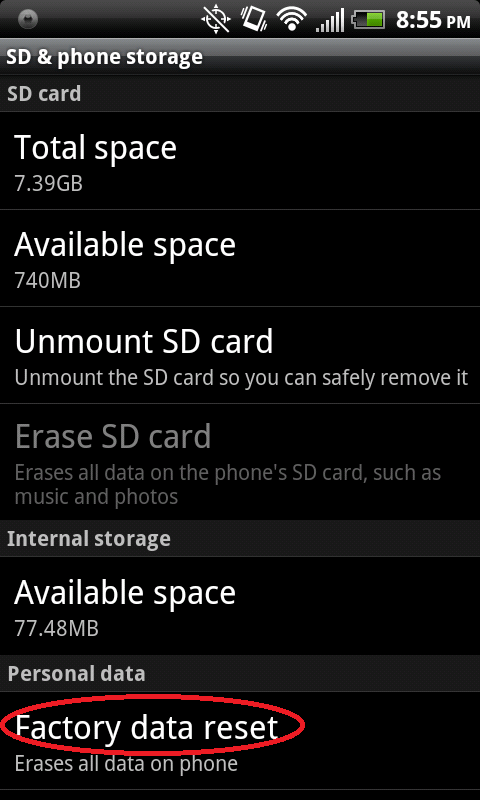 After that select the “SD & Phone Storage” option. That’s it you’ve done successfully.